It's a safe bet that Call of Duty: Black Ops will become the de facto multiplayer shooter of the fall, deservedly so for the intelligent, exciting online features that developer Treyarch is adding to the series—most notably, gambling. The meat and potatoes modes—the frenzied Capture the Flag, the destructive Search and Destroy, Team Deathmatch—were intact, a delight to play, but familiar. Capturing enemy flags and defending the one guarded by my team of strangers on a map dubbed "Slaughter House" was as adrenaline filled and chaotic as ever. Capture the Flag, a staple, plays almost exactly as it did in the most recent Call of Duty. Perfectly fine. Those now expected modes were spiced up by some of Black Ops' new killstreaks, like the RC-XD remote control explosive car which brings pint-sized but deadly driving to Call of Duty multiplayer. Players can also drop a SAM Turret onto the playfield that will target aircraft like the killstreak-called Attack Chopper. The vicious Attack Dogs of Call of Duty: World At War return in Black Ops, one of the late killstreaks that can help root out campers. Mortar Team was an interesting addition. Acquiring that killstreak lets the player paint three targets onto the map with mortar fire raining down on the map. It's similar to World At War's Artillery Strike. The Care Package killstreak can, in addition to dropping other killstreaks, provide players with rare weapons, like a mini-gun and rocket launcher. Unfortunately, I didn't get to try those rare weapons on for size. Black Ops appears to nail the obligatory online competitive aspects of a Call of Duty game, but Treyarch has something new and exciting to complement the multiplayer suite. You Want Some Of This Action? Wager Matches are wildly different custom game types. Comprised of four distinct free-for-all game types—One In The Chamber, Sharpshooter, Sticks and Stones, and Gun Game—players will ante up in a matchmaking lobby, wagering a set amount of the CoD Points they've accumulated by playing this and other multiplayer modes. The most nail-biting of those four Wager Match types, from my experience, was Gun Game. The rules are simple. Each player starts with the lowest tier weapon, a revolver. Each time a player scores a kill, he'll upgrade to the next weapon. There are 20 tiers of weapon in Gun Game, so players will advance from pistol to dual wielding pistols to shotguns to semi-automatic machine guns to assault rifles to grenade launchers... and beyond. While the power of those weapons tends to increase from tier to tier, the transition from tier to tier can be jarring, resetting the player's expectations of what his weapon is capable of. The tension of Gun Game increases sharply as players reach the final two tiers—the explosive crossbow and the ballistic knife. Those are two weapons that carry very limited ammo and slow reload times, leaving the player extremely vulnerable at top weapon tiers—and that's right around the time when other players are armed with assault rifles and "Thumper"-like grenade launchers. The other twist in Gun Game is that suffering knife kills drops players down a tier, a most painful regression. As much as I adored Gun Game, no Wager Match type managed to disappoint. Sticks and Stones was enjoyable for different reasons. Players are armed only with an explosive crossbow, ballistic knife and one tomahawk. Kills with the crossbow and knife will accumulate in-game wealth. A successful hit with the tomahawk—a thrown blade that requires expert accuracy—will bankrupt its victim. The weapon selection in Sticks and Stones leaves each player with minimal ammunition. Players must choose their shots carefully, for reloading or recovering one's tomahawk is slow, leaving a player vulnerable to attack. Sticks and Stones sometimes takes a turn for the comical as players engage in a deadly dance that slowly plays out as opponents square off, taking single shots, reloading in unison, firing again, missing again, reloading. It's as if it will ultimately devolve into each opponent throwing their crossbows at each other, then their boots, then settling the contest with a fist fight. Sharpshooter was another great equalizer. There is no weapon imbalance here. Every player in Sharpshooter is using the same type of gun at the same time. Players will start with a choice from the game's massive arsenal then switch to the next randomly chosen weapon. You may be playing with a shotgun at one point, then cycle to dual-wielded SMGs the next, a missile launcher 30 seconds later. The only differentiating factor in Sharpshooter are perks that players acquire with each kill. Skill and familiarity with Call of Duty: Black Ops' broad range of weapons will be key to seeing success in Sharpshooter. And while One In The Chamber, a Wager Match game type that grants each competitor three lives but just one bullet, was fun to play, it was my least favorite of the quartet. Players can acquire additional bullets by killing their opponents, so you'll need to be accurate with a pistol or skilled with a knife. One In The Chamber can lead to some tense hand-to-hand combat moments, but it was too lacking in variety, less panic-filled than Gun Game to make the top of my list. However, I spoke to other Black Ops players who felt the opposite, that One In The Chamber managed to stand out at the strongest Wager Match type. During my hands-on time with Call of Duty: Black Ops, I played on only a handful of maps. "Summit" is built on a snowy, flurry-filled Russian base. There's a large, covered command center at its core, with pathways that run along the map's border and a handful of small sheds in which to take shelter. Otherwise, it's very open in its design. "Radiation" was my favorite of the lot. It's full of nooks and crannies in which to explore (or camp), dark passageways in which to sneak and hide. There's a large open area in the center, flanked by platforms that offer high ground and a great view of the map. There's also an underground pathway in Radiation that can be accessed by doors. Players can choose to open or close those doors via a switch on a raised platform. "Launch" is a tight, close quarters map set on a missile platform. I played both Radiation and Launch in Gun Game mode, with the latter providing a much zippier experience, thanks to the tight proximity of players. At certain intervals, one of the massive missiles will blast off, violently rocking the playfield. Players can initiate these rocket launches themselves, perhaps to disorient the competition. I also played a few Capture the Flag rounds on "Slaughter House," a decimated urban area of Vietnam built from blown apart buildings and mini-mountains of rubble. Slaughter House is filled with pathways to explore, alleyways and buildings interweaving for a map that's stuffed with avenues to sprint through. The map flows splendidly. You want a list of the unlockable and purchaseable perks and killstreaks in Call of Duty: Black Ops? Here you go! Ghost - Undetectable by the Spy Plane and the Blackbird. Flak Jacket - Reduces explosive damage. Hardened - Bullets penetrate better. Scout - Hold breath longer. Warlord - Equip two attachments to your primary weapon. Second Chance - Pull out your pistol before dying. Hacker - Ability to detect enemy equipment and explosives. Tactical Mask - Reduces the effect of flash and concussion grenades. Treyarch appears to be on its way to delivering an impressive follow up to Call of Duty: Modern Warfare 2, a multiplayer experience that builds smartly upon that seminal shooter. 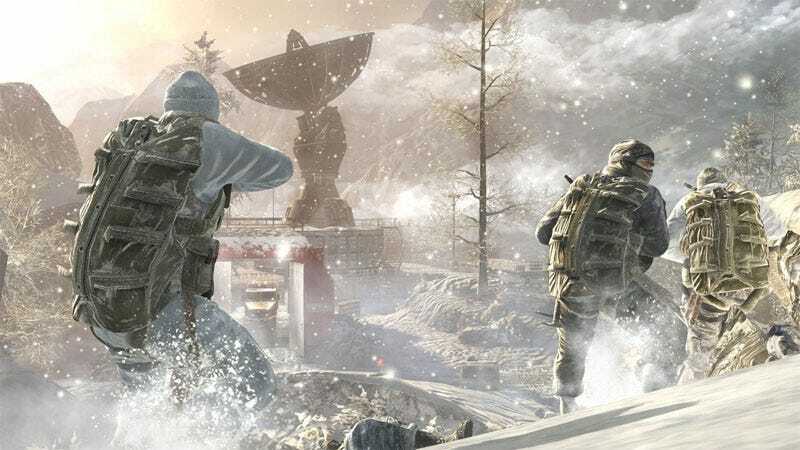 Players' expectations for a rock solid multiplayer component in Black Ops should be well met, with Wager Matches providing a surprising variation on the robust suite of familiar game types. It would be nice to see Wager Matches extend to more game types, including team-based play and standard deathmatch game types. But Call of Duty: Black Ops' multiplayer is, without a doubt, very promising. We'll have more from our hands-on experience with Call of Duty: Black Ops soon.